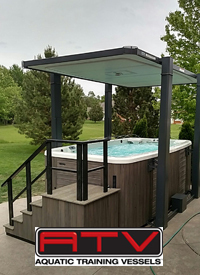 The BAQUACIL® CDX™ Pool Care System is a complete pool sanitizing system for above ground pools consisting of chlorine-free BAQUACIL® SWIMMING POOL SANITIZER AND ALGISTAT, BAQUACIL® OXIDIZER, and BAQUACIL® CDX™ product. 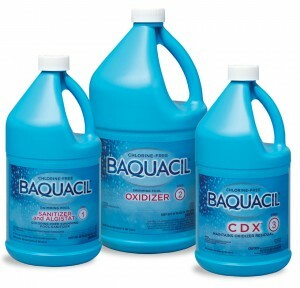 The product that actually kills bacteria in pool water is BAQUACIL® SWIMMING POOL SANITIZER AND ALGISTAT. 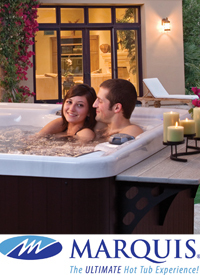 The two other products in the system work with this product to keep your pool sparkling clear and algae free. Swimming Pool Sanitizer and Algistat – a polymer-based liquid sanitizer that provides safe, consistent control of bacteria and algae. Oxidizer – A chlorine-free liquid oxidizer formulated with specially-stabilized hydrogen peroxide used to clarify pool water by removing swimmer waste and other pool contaminants. Algicide – A liquid algaecide that’s proven effective against a wide range of slime and algae, including common types such as green, black and mustard algae. 4-Way Test Strips – Easy to use, accurate test strips that measure pH, total alkalinity, BAQUACIL® Sanitizer and Algistat and BAQUACIL® Oxidizer. Surface Cleaner – A highly concentrated gel to remove metal stains, oil, scale and dirt both above and below the waterline. Cleans all types of pool and equipment surfaces. Can be applied directly to pool brush head for underwater cleaning and leaves no residue.